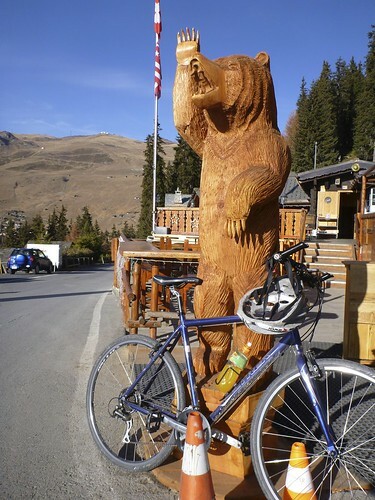 Contador and other wimps stop at Verbier. 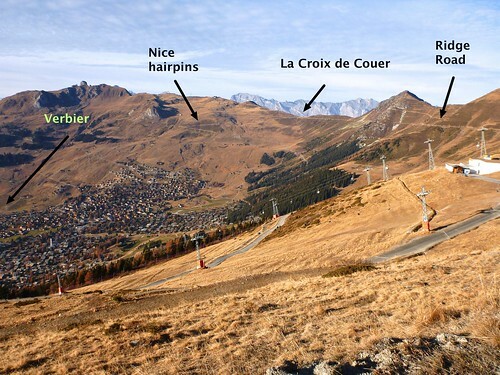 But slow, old guys (me) know that the climb only gets interesting higher up above Verbier. 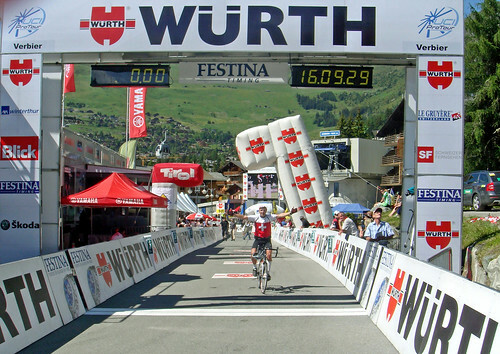 Verbier Ski Resort has recently hosted a mountain top Tour de Suisse stage (2008), and after a decade of lobbying, a Tour de France stage (2009 won by Alberto Contador). The climb to Verbier from Le Chable is very scenic and full of great hairpins. But with snow expected in a day or two, there was a fair bit of traffic. For details of the fabulous far side via La Tzoumaz see here. But the moment the route starts leaving town the road gets steep. 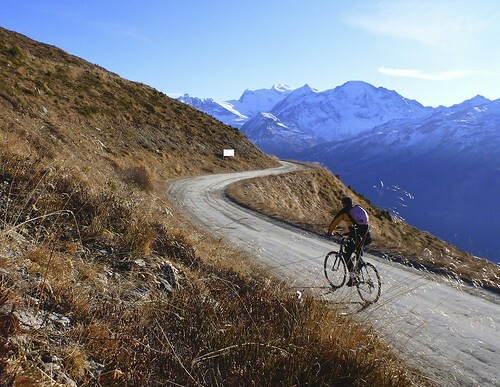 Every kilometre above Verbier is steeper than every kilometre below Verbier. I started the climb from Le Chable. 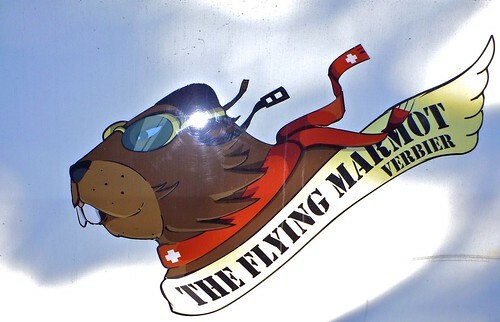 It’s possible to start lower down in Sembrancher, or even Martigny. But this just adds uninteresting kilometres on a road with fast traffic. 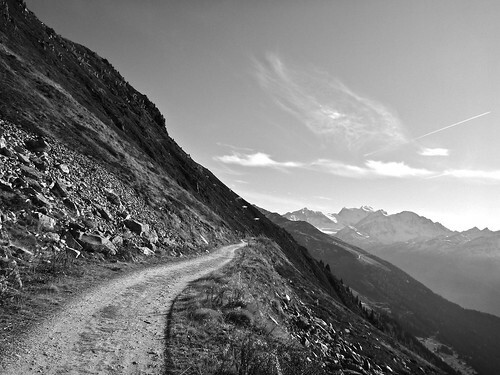 The summit exposes another valley and views into the Valais. And lots of high, snow covered mountains in the other direction. 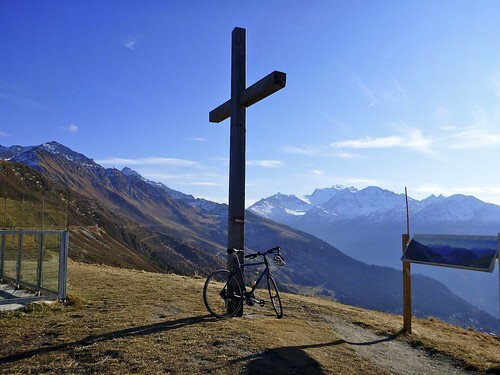 From the Cross is an amazing ridge road – completely flat – for almost 5 kilometres that heads straight towards a ski lift and big snow covered mountains. 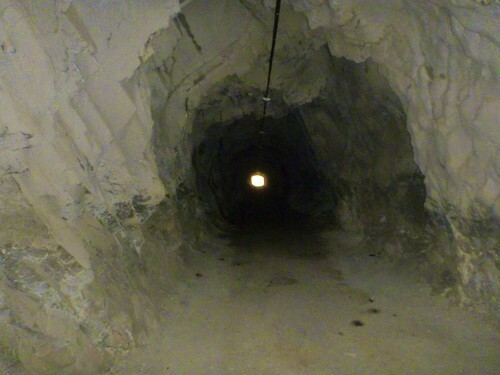 Half way is a very dark tunnel …. but I didn’t expect to see any cars (see photo below). 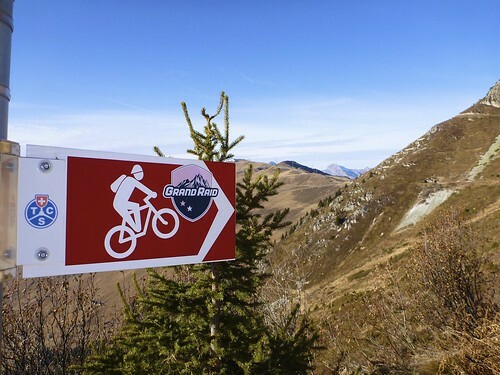 Much of my route follows the beginning of the Grand-Raid cycling event – it looks incredible but perhaps too tough for me. At the ski lift I took the road to Chaux for the views. In summer, there is perhaps more to explore. Once I saw a giant penguin (stork?, puffin? ), I decided it was time to head back. I doubled back to the ski lift – and as marked on the map – descended a good quality gravel road until rejoining the main road. This gravel stretch is steep but certainly climb-able. 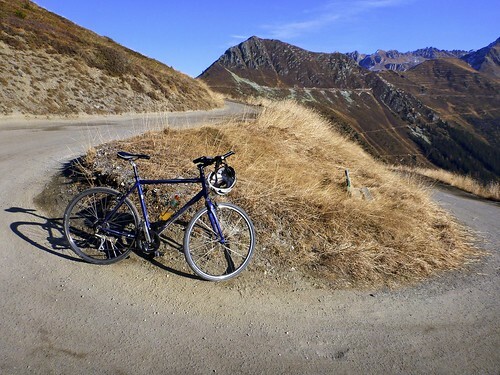 the route up to Croix de Coeur is paved until about 1900 metres. The last 3 steep kilometres are gravel road and unfortunately not suitable for a road bike – I used a hybrid. The entire ridge ride is gravel. I have a warm spot in my heart for Verbier as it was my first stage victory in 2008 – 2 hours before the pros 🙂 . 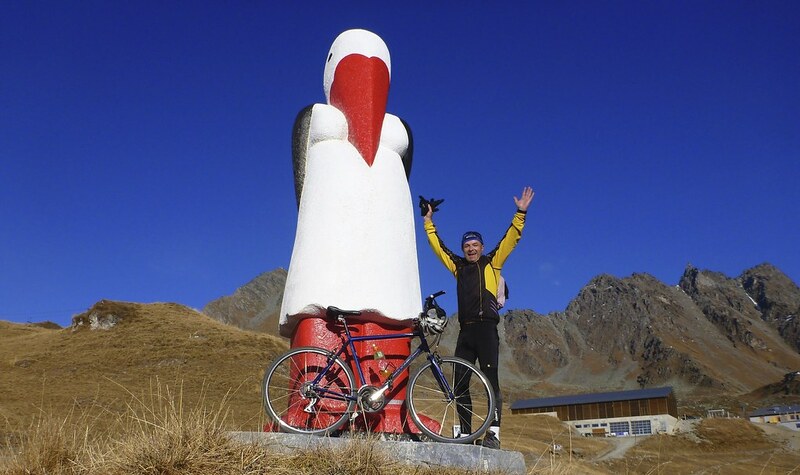 You are an amazing cyclist! 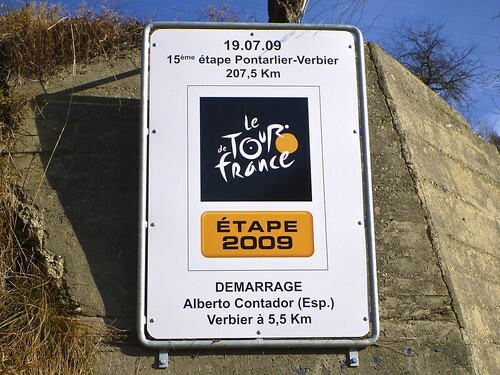 You beat the professional riders by two hours on this climb! Will, isn’t it more Croix de Coeur or Heart’s cross ?? SImon, ooops. Thanks, just a silly spelling mistake. I did this climb today (with the boring extra km from Sembrancher, good to warm up with). It is asphalted all the way to the top. I mentioned it to a local who said that he thought it must have been paved last year. Does anyone know if the road down to La Tzoumaz is paved? 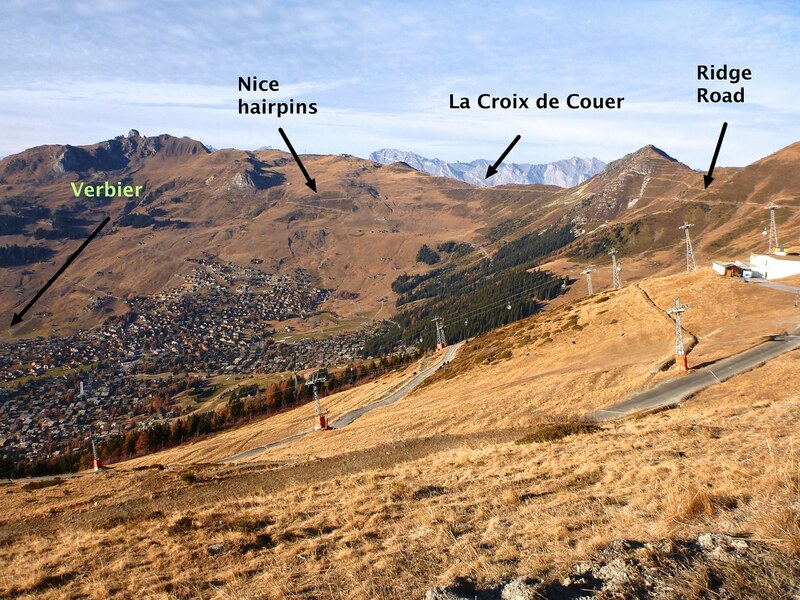 I plan on doing this ride from Nendaz & back on a road bike shortly. I have ridden from Croix de Coeur down to Riddes in 2009 year. Rough at wood stretch just above La Tzoumaz but still rideable on road bike.